Made by Bates, Clara in Ginkin, New South Wales, 1890-1915. A rectangular double bed size patchwork quilt, hand pieced from a variety of multi-coloured silks, ribbons and velvets and embroidered along the seams with double feather stitch in golden yellow silk. The regular design features a 250 x 250 mm dark red velvet square in the centre, surrounded by 150 x 150 mm octagons each composed of four hexagonal rhomboids around a 50 x 50 mm black velvet square. Each rhomboid is shared with the adjacent, overlapping octagon. Almost every piece is embroidered with a flower, household item, hand tool, insect or bird, with the occasional date (1894, 1895, 1898 and 1915) and initial or name (A, CB, Percy). Some pieces have a three dimensional applique, eg a tiny pipe, swag, shell and money bag; occasional pieces are beaded or sequinned. The quilt is backed with plain red cotton sateen, which has been hemmed to the quilt on all four sides and hand stitched through along the seams of the quilt at regular intervals. Along one long edge, black ribbon or tape has been looped, presumably for hanging. The quilt was handpieced and embroidered by Mrs Clara Bate, in Ginkin, New South Wales, Australia,1890-1915. The principal form used is an elongated hexagon. There are 592 in all, nearly all of which have been embroidered with a wide range of motifs - flowers, birds, animals, fruits and vegetables, together with a pipe, a pawnbroker's sign, a cross or dagger, a peacock feather. Additional ornaments include buttons, metal charms, tiny shells, ribbons, sequins and beads, the occasional letter, and the name Percy. Each seam is strengthened and ornamented with feather stitching in gold silk. The coherence of the quilt suggests that it was entirely worked by Clara Bate, with the final row of feather stitching around the outside probably completed by her sister Emma in 1914-15. Mrs Clara Bate, the maker of the quilt was born in 1859 to John and Annie Hughes. She grew up in the Bathurst district where her father was a farmer. In 1865, when Clara was six, the Hughes relocated to Ginkin whre they bought the 640 acre property Ginkin Station. John Hughes was related by marriage to the previous owner of Ginkin Station, James Whalan, who is officially recognised as the first European to see the Jenolan Caves. Clara married Frank Picton Bate in 1884, when she was 25. Eventually, she and Frank moved into 'Frankfort' at Ginkin, where they established a guesthouse, which Clara ran, and a farm. The main drawcard for visitors to 'Frankfort' were the nearby Jenolan Caves which were attracting some 2000 visitors a year by the end of the 1800s. One large cave was fitted with a dance floor and hosted many local picnics and country balls. 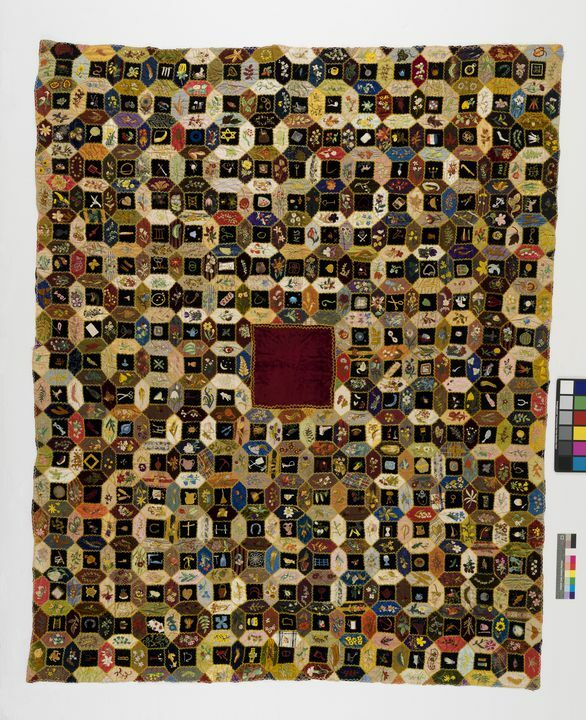 Family history suggests that Clara worked on the quilt all her life and that its imagery reflects both her daily life and its significant events. There are reports of the quilt at the guesthouse as early as 1897 although it was not finished until after Clara's death in 1914 when her sister Emma is thought to have completed it - and added the latest date 1915. From Clara Bate, the quilt went to her sister Emma, to her neice Doris and then to her nephew's wife, the mother of the three sisters Jean Barnard, Robyn Throsby and Joy Woods (nee Hughes) who are named as donors. Clara Bate was their father's aunt and therefore their great aunt.